It hasn't even been a year since Roku last updated its line of streaming media players -- but nine months is a long time in the gadget world. So it was pleasant, though not entirely surprising, to spot a trio of new devices from the IPTV pioneer sauntering through the FCC bearing the model numbers 3000X, 3050X, and 3100X. Eventually the three boxes will likely be sold as the Roku 2 HD, XD, and XS respectively. We'll have to wait to see if there's anything new on the software side, but we can tell you there have been a host of hardware changes, even if they don't amount to a major upgrade. First off, the new models are more rounded and much smaller than their predecessors. Judging by the label affixed to the underside -- which we know is 44.65mm x 44.65mm (about 1.7 inches) -- the latest Rokus are about the size of an Apple TV, and perhaps a bit smaller. Inside that tiny case is a new Broadcom 2835 SOC, an 802.11n radio, a MicroSD slot, Bluetooth, and (most exciting) a reset button -- no more unplugging when Hulu freezes up. Oddly, only the XS retains the Ethernet jack, though the top of the line model ditches support for dual-band WiFi. The primary difference between the HD and XD models still appears to be the latter's ability to push out 1080p video, while the XS adds a USB port and gets a spiffy new RF remote, which we're hoping takes a cue from the Boxee clicker. 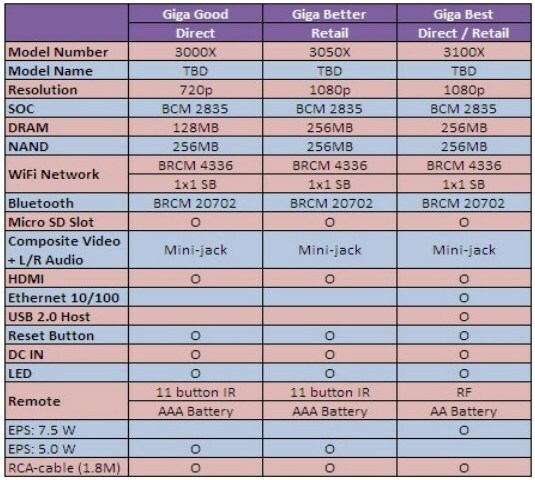 While you impatiently await important information, like pricing and release date, check out the comparison chart after the break.